1922: The company was founded as Swallow Sidecar Company, hence 'SS', by William Lyons and William Walmsley. 1927: Production of a 2-seat body for the Austin Seven, later an Austin Seven Swallow saloon, and bodies for other cars. 1931: The 'SS I' and 'SS II', based on Standard Motor Co. chassis, were unveiled at the London Motor Show. 1935: SS revealed the 'Jaguar' 4-door sports saloon just before the London Motor Show. 1936: The 'SS 100' sports car, and in 1938, an attractive SS 100 fixed-head coupe. 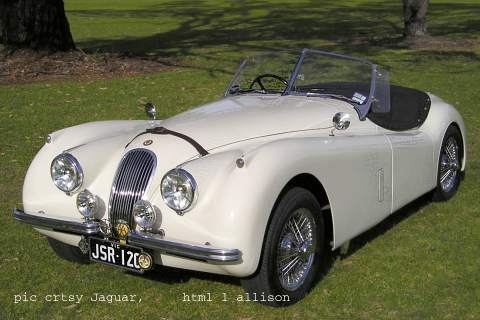 1945: The company name became Jaguar Cars Ltd. – 'SS' was "on the nose" after WWII. 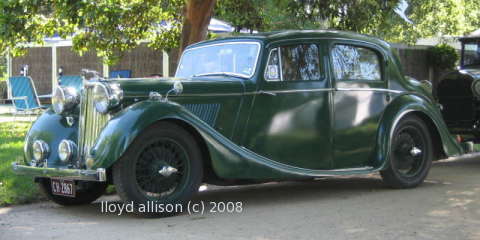 1948: The 'Mark V' was the first post-war design, in saloon and drop-head versions. 1948-1954: Jaguar 'XK120', 3.4-litre, dohc, straight-6. 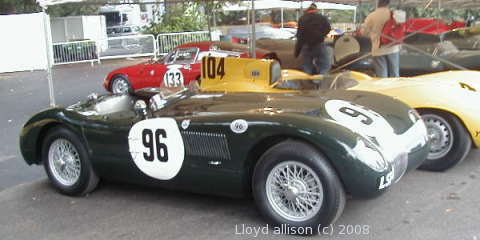 1951-1953: 'C-type', racing; the C-type introduced disc brakes; 52 were built. July 2008: A 1955 Jaguar D-type, XKD509, sold at auction for £2,201,500; new price was £2,500. August 2013: Chassis #XKD 530 (1955) sold for us$3,905,000. 19-20 August 2016: A 1955 Jaguar D-type, chassis #XKD 501, sold for us$21,780,000 at Sotherbys Monterey auction. 1960: Jaguar bought Daimler Motor Company (note, not Daimler Benz as in Mercedes). 1961: The large 'Mark X' saloon was announced. 1963: The 'S-type' saloon was announced. 1966: The '420' saloon (4.2 litre) was introduced. 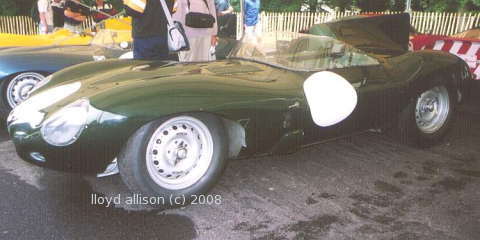 1966: A prototype Jaguar 'XJ13' rear-engined V12 race car was built but the project lapsed. 1968: First Jaguar 'XJ6'. 4.2-litre or 2.8-litre straight 6-cylinder engines, £1800 - £2400. 1972 July: 5.3-litre V12 engine offered in the 'XJ12' saloon. 1972 September: long wheelbase XJ model introduced. 1975: The 'XJ-S' sports car was launched, with the V12 engine. 1979 March: third generation XJ. 1986 October: 'XJ40' unveiled, 5-speed manual or 4-speed auto., rectangular headlamps (which soon dated). 1988: The V12 Jaguar XJR-9LM of Lammers, Dumfries & Wallace won the Le Mans 24-hour race, covering 5332.790km (221.665km/h, 0.6km/h shy of Porsche's 1971 record). 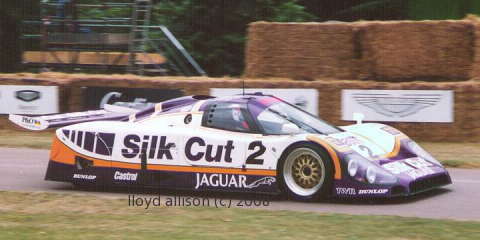 1990: The Jaguar XJR-12 (7-litre V12) of Brundle, Nielsen & Cobb won the Le Mans 24-hours race, covering 4882.400km (204.036km/h). 1992: The rear (mid) engined, twin-turbo V6, Jaguar 'XJ220' road car could top 210mph and probably nudge 220. 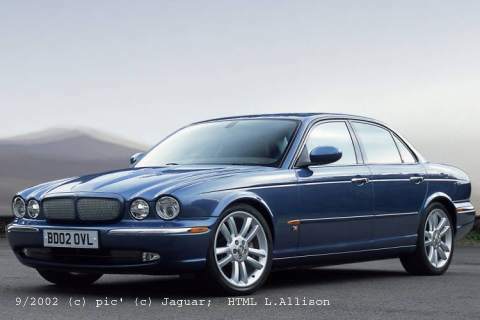 1994: X300 (XJ6/ XJ12) launched, 3.2-litre or 4.0-litre 6-cyl, or 6.0-litre V12 engines. 1996: The 'XJ-S' was replaced by the 'XK8', coupe and convertible. 1997: 6-cyl. and V12 engines discontinued, replaced by V8's in the 'XJ8'. 1999: The 'S-Type' went into production, the name harking back to 1963. 2002 September 26, Paris Motor Show: 7th generation XJ shown. "The new XJ body is manufactured almost entirely from aluminium ... 40% lighter than that of the equivalent steel body. ... 60% stiffer than its predecessor." Loa 5080mm, width 1868mm, height 1448mm, wheelbase 3034mm. Engine options: 4.2-litre V8 (300bhp), 4.2-litre supercharged V8 (400bhp), 3.5-litre V8 (262bhp), 3.0-litre V6. 2007 June: Ford put Jaguar, and LandRover, up for sale. 2008: The 'XF' sedan (replacement for the mid-range S-type); at the Frankfurt motor show 13-23 Sept. 2007; on sale from March 2008; 5-seat, 4-door coupe; 2.7D/ 3.0 V6/ 4.2 V8/ 4.2 V8 s/c; ZF 6-speed sequential manual/auto gearbox; rear wheel drive; £34K-£55K; .au $106K-$167 from June 2008. If the styling resembles another marque there is a touch of Bentley GT about it. 2008, March 26: Cash-strapped Ford agreed to sell Jaguar, and Land Rover, to Tata Motors of India for about $2.3billion. The deal was completed on 2 June 2008. 2009 July: Jaguar revealed its new XJ saloon, with the new Jag. (~XF) look, and six-speed ZF automatic transmission with paddle-shift -- from £52,500. 2010: 3.0-litre, V6, twin turbo diesel (275bhp), from £53,755, 5.0-litre, V8, direct injection (385bhp) £74,355, and the supercharged (510bhp) Supersport, £87,455. 2012: The 2-seat 'F-type' Jaguar was launched at the Paris Motor Show, 3-litre supercharged V6 340bhp, or 380bhp, or 5-litre supercharged V8 engines, 8-speed automatic.